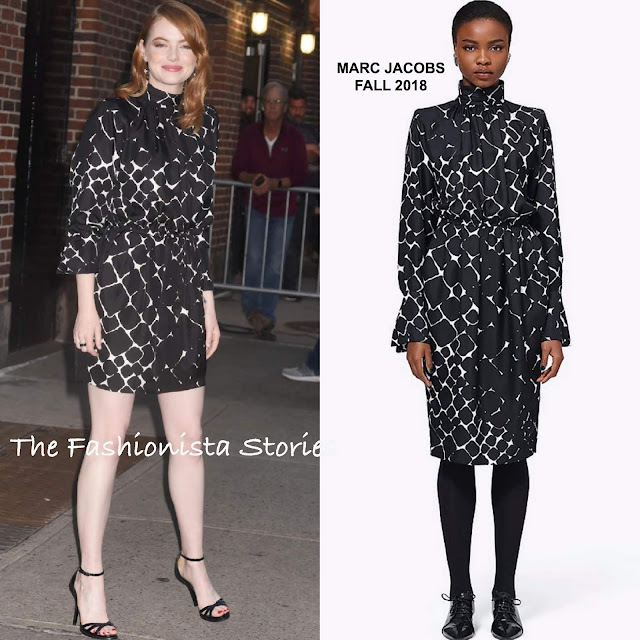 Following her appearance on GMA, Emma Stone was spotted leaving the Late Show with Stephen Colbert in New York on yesterday(September 19th). Since becoming an Louis Vuitton ambassador, we have seen Emma wear a lot of looks from the fashion house but for the second time in a row, she opted for a different designer. This time around, she tuned to MARC JACOBS. She wore a FALL 2018 black & white silk abstract, diamond printed dress, featuring a gathered mock neckline and waist. I like Emma's edit of the dress which is shorter, with the sleeves pulled up. Side parted tresses and black sandals finished up her look.